When you think about deep-sea exploration, the first image that might well pop into your head is a Remotely Operated Vehicle (ROV) unmanned and plunging its way down to the depths of the ocean. There is still so much left to discover about our oceans, with NOAA (National Oceanic and Atmospheric Administration) suggesting that we have explored less than 5% of our oceans. Despite that fact, oceanic exploration has certainly come a long way since those brave divers of the 19th Century, in their ‘heavy footer’ suits with the cumbersome metal helmets and weighted boots. Fast forward to the 21st Century and Stanford University is working to bring something resembling those antique diving suits back to life – except this time there’s no person inside. 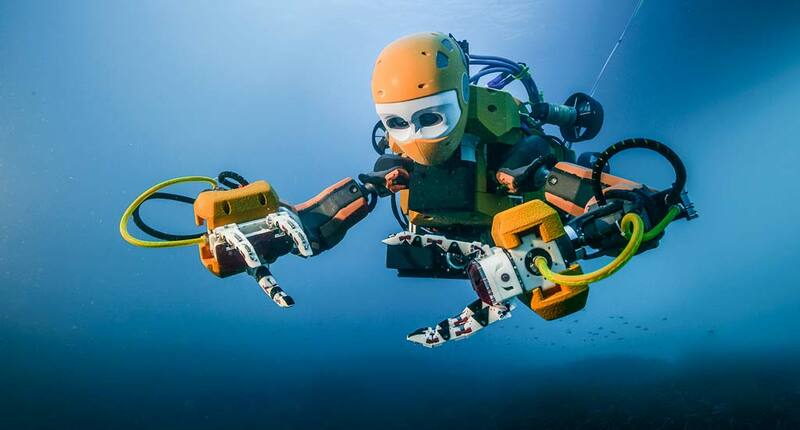 The inspiration behind developing an ocean going robot came from King Abdullah University of Science and Technology (KAUST) in Saudi Arabia. Professors there were looking for a way of monitoring deep mesophotic coral reefs in the Red Sea. These corals inhabit the oceans at depths far beyond human range. The study of these reefs is becoming increasingly important as coral reef cover nearer the surface of the ocean is continuing to shrink at unprecedented rates. Standard practice when studying deep-sea specimens has been to use an ROV to collect a sample which can then be brought to the surface to be studied further. The problem with this system is that ROVs have a number of disadvantages including their bulky size and lack of maneuverability. This can mean potential damage to the reefs when attempting to collect samples. Additionally, this method removes the specimen from its natural habitat, which will potentially change its behavior. The team at KAUST contacted Stanford University’s Robotics Lab to see if they could come up with a solution. Oussama Khatib and his team then set to work designing a new robot to emulate the skill and care of a human diver. With those human skills and aptitudes in mind, Ocean One has been developed not only to closely mimic the abilities of a human diver, but to work with a team at sea level, who provide cognitive capabilities and expertise. The design on Ocean One is incredibly well thought out, incorporating bimanual arms, stereoscopic vision, eight thrusters and hands combining force sensors and haptic feedback. Despite the fact that haptic feedback might not be a term familiar to everyone, you can pretty much guarantee that you’ve used it. Simply put, haptic feedback, or ‘haptics’ is the use of touch feedback. In its most basic form, haptics is felt through the vibrations on your smartphone. Reflecting the contact forces back to the operator allows the human controller to share a sense of touch, vital to sensitive operations such as sampling deep-sea habitats or collecting artefacts from shipwrecks. In April 2016, Ocean One’s first mission was to explore a shipwreck with its team. The location was the shipwreck of La Lune, 20 miles off the southern coast of France. La Lune was wrecked in 1664, and resting at 100 meters below the surface of the Mediterranean, her position was too deep for humans to reach. As a flagship of King Louis XIV, it was very likely that La Lune contained artefacts valuable to archeologists. The team at Stanford had studied the site carefully and identified a vase, the retrieval of which was the job of Ocean One. The robot was gently lowered into the sea, and using joystick control Oussama Khatib gently guided it toward the vase. The robot reached out to touch the vase and using haptic feedback, relayed information to Khatib. The feedback has been so cleverly designed that the team say it allows them to feel the weight and texture of an object. Ocean One carefully picked up the vase and placed it in a basket for transportation to the surface. The mission was a total triumph, with Khatib being the first person to hold the vase in over 300 years. The true capabilities of Ocean One were perfectly demonstrated when on returning to the research vessel, the robot swam too closely between two wrecked cannons and became stuck. Khatib took control of the arms and indicated a push-up motion, which the robot carried out, successfully freeing itself. Ultimately, Ocean One is not just designed for discovering the treasures of shipwrecks or deep-sea corals. Stanford also hope that it will be able to take on tasks that are too dangerous for human divers, such as deep oil-rig maintenance or even potentially underwater disaster situations. Rather than waterproofing the robot’s electronics, they are immersed in oil instead, which doesn’t compress under the pressure of the ocean, theoretically allowing Ocean One to reach depths of up to 2000 meters. In contrast to many robots which seek to remove the necessity of human involvement, Ocean One has been designed to draw on the complementary strengths of both people and robots, providing us with a revolutionary step forward for marine science. Oceanic exploration has never looked so exciting.